Lay out 8 strips of bacon on a baking sheet lined with parchment paper. Fold up every other piece and then lay in horizontal pieces of bacon. Alternate vertical strips and make rows of bacon until you complete the weave. Bake the bacon at 425°F for 15-20 minutes. Drain off grease, flip the weave, and bake for another 5 minutes. Meanwhile, add diced veggies to a skillet over medium heat with a drizzle of oil. Add seasoning to the veggies and cook until they are soft. 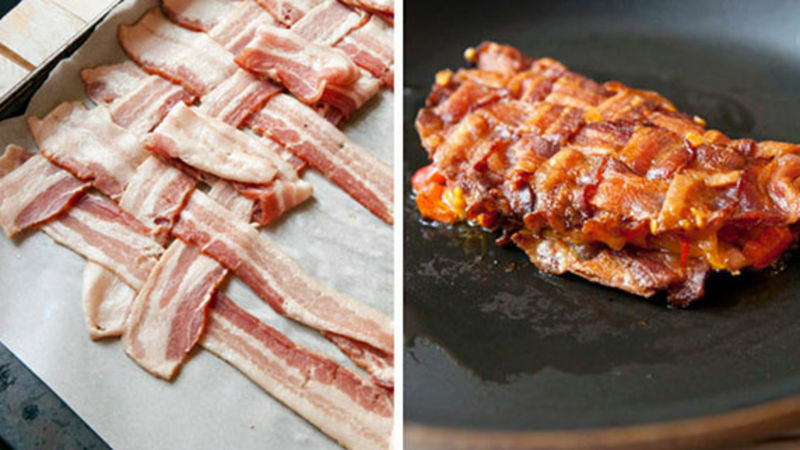 When bacon weave is cooked, let it cool a bit and then cut off corners of the weave to form a circle (if you want). Add veggies to one half of the weave and top with cheese. Fold the bacon over itself and add the weave to the skillet over medium heat. Cook the quesadilla for a few minutes per side until cheese is melted and the bacon is crispy. Remove from the pan and let the quesadilla cool for a bit. Slice the quesadilla into quarters and serve with sour cream and cilantro. Not everything in the cooking world is the most logical. Is it easy to slap together a quick quesadilla with a plain flour tortilla and some cheese? Absolutely. But that can get boring. Making your own quesadilla shell out of bacon is one way to cure boredom! That’s how I came up with the bacon weave quesadilla. Part boredom, part love of bacon. If you’re feeling adventurous, give this a shot – it’s not as hard as it looks. Obviously, the tricky part of this quesadilla is the woven bacon shell. Start by preheating your oven to 425 degrees F and lining a baking sheet with parchment paper. Then lay out half of your bacon strips vertically. You need a perfect square, so 8x8 strips is a good guess for what will work, but it will depend on the size of your strips to some degree. Then fold up every other bacon strip and lay in a row of bacon horizontally. Alternate the vertical strips and lay in the horizontal strips as you work down. Your final weave should be pretty tight and not have a lot of gaps in it. This might look complicated, but really it only takes me a few minutes to make – it’s not that hard! Stick this in the oven and bake it for 15-20 minutes. Then drain off the grease (there will probably be a lot) and flip the weave. It should be pretty sturdy at this point. Bake for another 5 minutes or so; the bacon should be starting to get crispy but still be flexible. It’s important that you don’t cook it until it’s completely crispy – you won’t be able to shape it into a quesadilla! I also cut off the corners of my weave to make it more of a circle, like a tortilla. I kept the fillings very simple for this quesadilla since the bacon is obviously really rich and tasty. I just used some red peppers, onions, and taco seasoning! Cook the veggies in a drizzle of oil over medium heat, add some taco seasoning to the skillet and cook the veggies until they’re soft. When the filling is done and the bacon shell is done, add some grated cheese to the bacon, then top with the veggies, and follow it up with even more cheese. Fold this over, add the whole quesadilla to the skillet over medium heat, and let it cook until the bacon starts to get crispy and the cheese melts. Chop this into quarters and serve each piece with sour cream and cilantro. Honestly, these are so rich that I think they work best as an appetizer, but I suppose you could hoard one all to yourself…if you want to eat 16 strips of bacon in one sitting! Nick did not eat this whole thing by himself because he values his arteries. Be sure to check out his blog, Macheesmo, and follow him on his Tablespoon Profile.